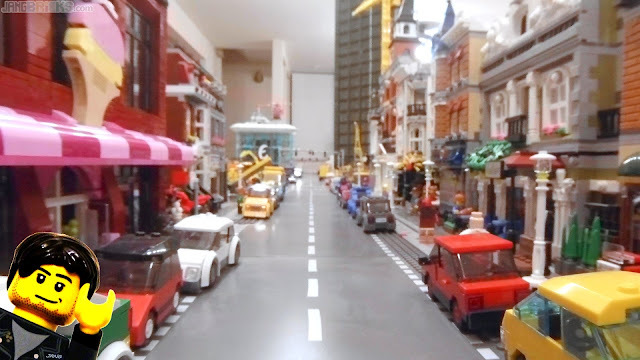 In recent months I believe type of video most requested by viewers is a minifig-view drive through the streets of my main layout. I believe most folks asking for such a thing had an RC car with a camera on it in mind. However, RC cars sufficiently small and yet well-controlled at very slow speeds are surprisingly rare. Even more critically, RC cars can't handle the extremely tight turns of LEGO road baseplates unless you take them extremely wide and just right, which ultimately leads to awkward multi-point turns. After carefully researching & ruling out every single wheeled option I could find, I turned my attention to tanks, since they are generally slow and can spin within their own length. Here again I found a shocking dearth of qualified candidates, with just two options passing cursory inspection. This video here is taken with the second option, the initial design intent of my most recent Planetary Defense Force utility vehicle. This was literally my first attempt at this style of video and there is much obvious room for improvement. Getting to this point has required a pretty crazy amount of research & experimentation, though, dating back long before the RC search began. Everything always seems so simple & obvious until you try it! This is brilliant- it feels like viewing the city from the front of a double-decker bus. Awesome video, Sir. I'm inspired by your custom builds. Very cool. Usually my kids make me watch videos several times over, but this time I viewed it multiple times on my own accord... every time spotting some new detail. Well done.